Last year, Art Asylum hooked up with Mike Markowitz, and Aztech Toys was born. 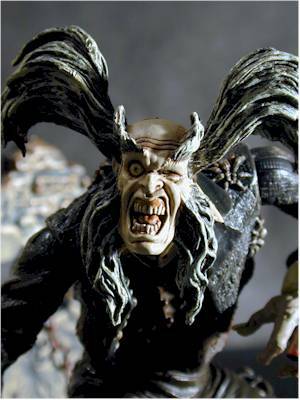 Aztech produced a series of unusual horror figures, based on the early silent films, and called them Silent Screamers. Knock Renfield was the psychotic gopher of the infamous vampire, Nosferatu. These figures are currently going on clearance at several places, and will be in many more. The best spot right now is from www.kbkids.com where they are $4.99. There are two versions of each - a 'color' version and a 'black and white' version. The only thing lacking here is the ability to remove the figure from the card without destroying it. Otherwise, this packaging is absolutely perfect - the graphics are beautiful, the design eye catching and attractive. 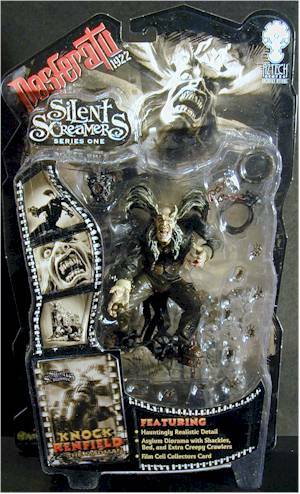 The small 'Silent Screamers' logo is also loose in the package, and makes a great display item. By the way, the terrific package art was done by none other than Alex Ross! There are 8 points of articulation on Renfield, and the ball jointed shoulders are nice. But the lack of elbows and knees hurt the figure, particularly since the lower body is forced to remain in a single stance. 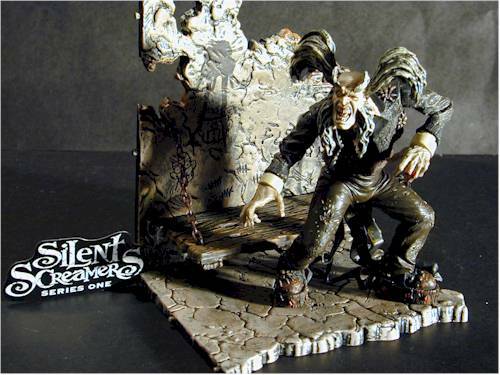 Art Asylum does wonderful sculpts - there is no doubt about it. Renfield is excellent, with only one problem - he doesn't really follow the source material. All of these figures were done based on the original movies, but with the interpretation of Art Asylum. That results in a figure that doesn't quite fit with the fans of the originals, but can't quite get enough people unfamiliar with the source material interested. Renfield comes with a marvelous base, designed as his cell. He also comes with shackles that open, 10 little spiders and bugs, and a mask stolen from cell mate Hannibal Lecter. The quality of these accessories is great, with wonderful sculpting and real chains used for the shackles and wall chains. 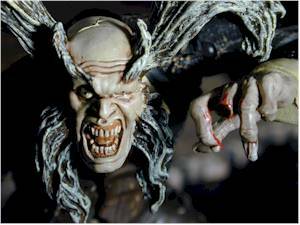 This base attaches to the base that comes with the Nosferatu figure, creating a great display. By itself, this display tends to lean over however, so I'm hoping that once the two are connected there is more strength. Original price on these was around ten bucks, which wasn't a terrible price considering the level of quality and accessories that you received. But on clearance, as they are now starting to appear, is a fantastic deal. If you find these for five bucks or less, grab them! The only flaw here is that the articulation is weak. Deviating from the source material also hurts the figure some what in my opinion, but your mileage may vary. I still think they are well worth the money, and it's unfortunate that Aztech Toys is now out of business. I have heard that a second series of figures will show up soon though, and that should make horror fans quite happy. Word is that Aztech Toys is no more, but hopefully we'll get that second series before they're finished.